The life and passion of a person leave an imprint on the ether of a place. it flows out to build secret tabernacles in a landscape. 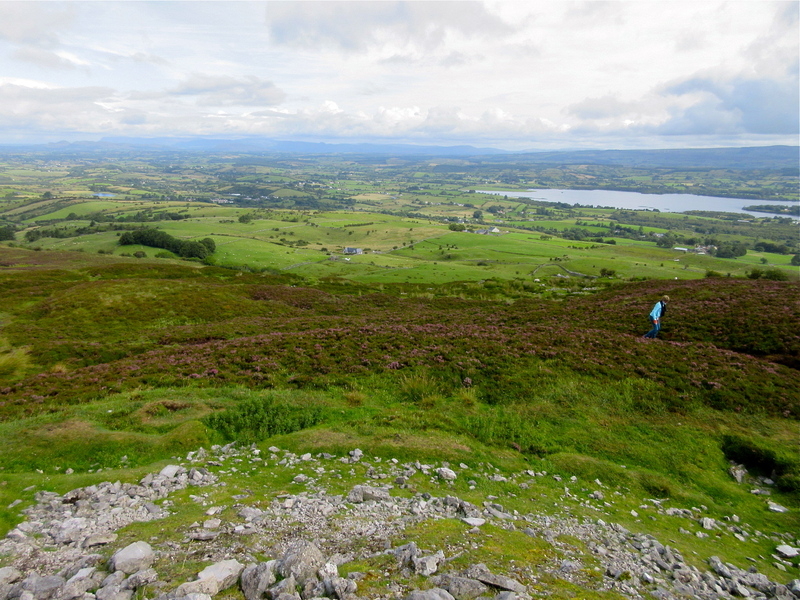 I recently visited several sacred sites in Ireland with a group of kindred spirits. We traveled to this land, ever rich with the fecundity of spring and the healing energies of its ancestors, for many reasons. Some, to shake loose from stuck places, reconnect with nature or explore family history. Others, with whom I was vaguely aligned, seeking healing for themselves, loved ones, and even for our planet. I was not completely sure why I was drawn to this particular country, named for the Gaelic Goddess Eriu, for this purpose. My ancestors are Polish, as far back as we can trace. What I did know is that I was called to go. For years, flyers promoting tours, movies showcasing its verdant countryside, enchanting stories about the land’s fairy realm, and my fondness for the charming accents and kindness of its people beckoned. I had also discovered the writings of Irish poet, philosopher, and scholar John O’Donohue, whose books about Celtic spirituality had found a special place in my heart. His book Anam Cara, which means soul friend, has become a favorite. And, I had the good fortune to discover a wonderful travel company out of England called Journeys With Soul, which provides tours that take one off the beaten path into the true heart of the land. So I traveled over 6,000 miles from my home in Northern California to explore and experience this vibrant, so-beautiful-it-makes-you-cry land, seeking healing for myself and a long list of friends and loved ones. Carrowkeel in the Bricklieve Mountains. And, shortly after I arrived, it became quite evident why I’d chosen this country, this place. The dreamer in me started to catch synchronicities that were emerging all around, as my journey became a “waking dream.” (A year before, I had created a myth, comprised of images, characters, and events that came to me in my nighttime dreams and through self-guided meditations, as the core of my thesis for a depth psychology graduate program.) And there, in a country I’d never been to, these dreamscape images were appearing before my eyes. My traveling mates, however, believed that I might indeed have been there before –– in another lifetime. You’re remembering a past life. What felt real, in my bones and in my heart, was that my dreams had called me to this vast and sacred place, because my soul knew where I needed to go to heal old wounds and seek healing for those I hold dear. And this was most certainly a place of healing. The sites we visited were so alive with the energies of the ancestors –– their wisdom and compassion –– that you could literally feel waves of healing energy flowing through your body as you stood within them. It was like experiencing impossibly powerful Reike. The stone circle at Carrowmore. Sitting atop a rock in a Neolithic stone circle in Carrowmore, I put forth my intentions for the physical and emotional healing of friends and family members back in the states, and I had no doubt that the ancestors who had built, visited, and helped preserve this 5000-year-old sacred site were at work, holding us all and sharing their love, still alive in the surrounding earth, the stones, even the buffeting winds. When I opened my eyes, a raven sitting on a fencepost several yards away watched me and continuously cawed beneath cloud-dotted, crystal-blue skies, calling me to him – just as the Black Spirit Bird calls the heroine in the myth I wrote. 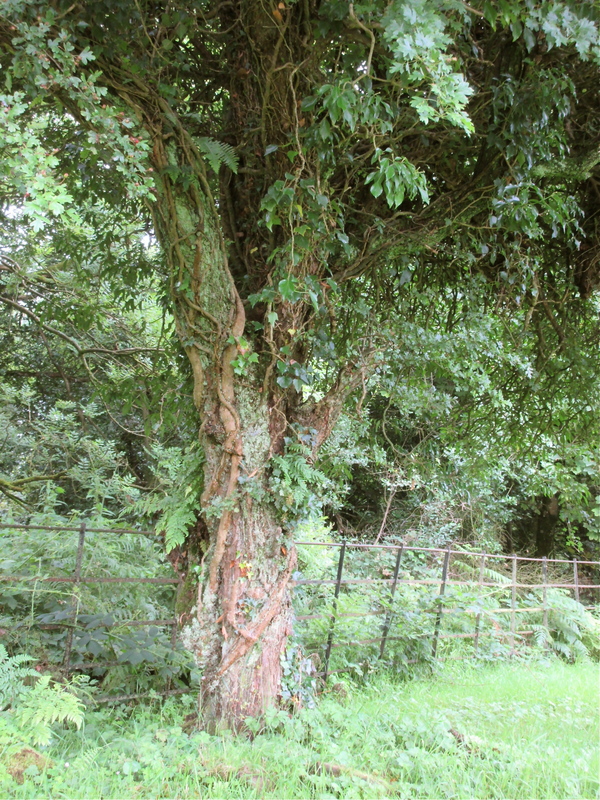 An ancient hawthorn tree at Caldragh. I had also written about hawthorn trees, which we found surrounding the early Christian graveyard of Caldragh on Boa Island. I’d never seen a hawthorn tree before, and didn’t know that this ancient thorny species is a Celtic symbol of cleansing and preparation and also of Christianity’s struggle to suppress Pagan beliefs and celebrations. And as we wandered through the medieval Franciscan Moyne Abbey (1462 A.D.) in County Mayo, I could have sworn that I smelt the musty scent of incense intermingled with wood smoke in the raindrop-glistening rooms of the roofless ruins. And in one long-abandoned space where great piles of crumbled stone crosses and fallen cornices lied, my camera continued shooting several photographs I had not planned on taking, producing a sepia shot I didn’t know was possible – light, that hadn’t been there, pouring through the pane-less window in the photo. 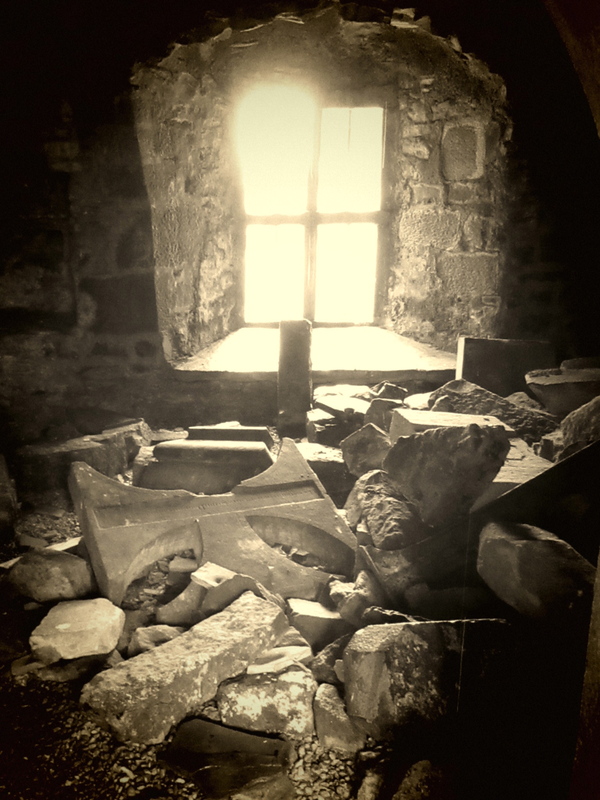 The photo that took itself in the abbey in County Mayo. Yet, most magical was the Hill of Tara in the ancient capital of Leinster, where as Irish myth goes, the king undertook the Ban Fheis, or sacred marriage to the Goddess in order to secure fertility and wellbeing for the land and his people. Tara is at the center of the “golden triangle” of fertile land that stretches from Ireland’s east coast, between Dublin and Dundalk. 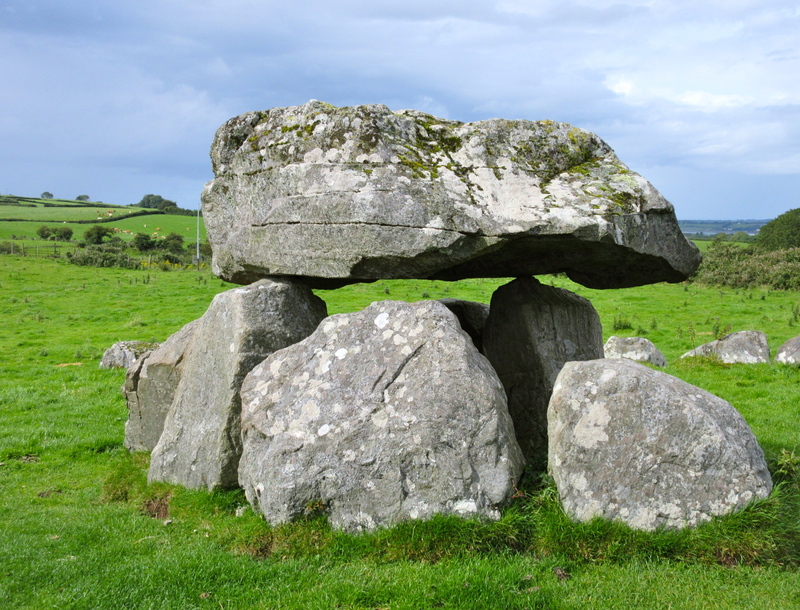 And although it was the place of many battles and other masculine conquests –– and boasts a very phallic-looking Stone of Destiny –– it was also a royal sacred site, which today, for those who seek it, holds the powerful healing energies of the Great Mother. 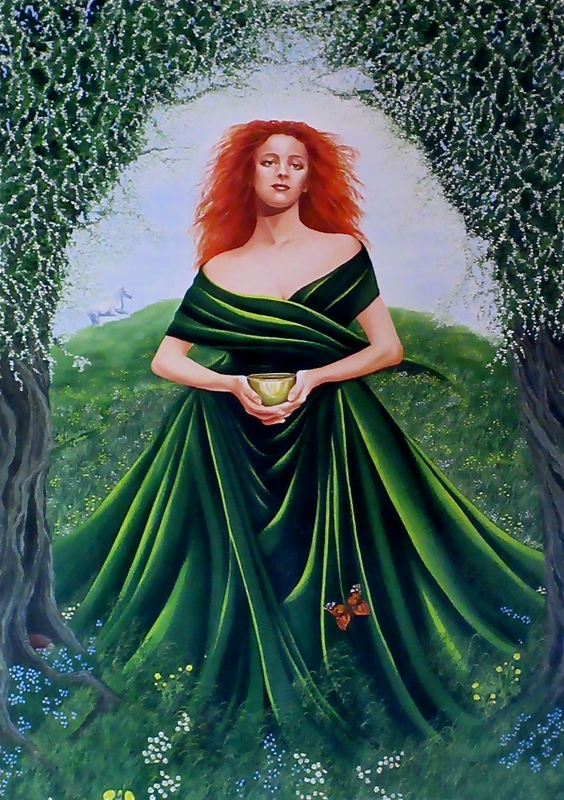 As I lay still beneath the sun in the soft green of Tara’s earth-formed mounds, creating a circle with the rest of my travel companions, I felt cradled, as if in the arms of a strong, yet tender-hearted, wise woman. And as more scenes from the myth I had written appeared before me in my waking dream – a portrait of my character (exactly how I’d described her) in a small café; a raven following me on a walk to The Well at Tara, where I blessed a moonstone I’d purchased; the thatched-roof cottages we’d driven past; the rushing Boyne River, so much like the one my heroine crossed –– I knew with a viscerally-felt certainty that we are held, all of us, in the hearts of those who have come before us, even if we are not of their flesh and blood. The portrait in a cafe in Tara (the image of my myth’s heroine). The healing I sought came in the form of a radical reclamation of the sacred feminine, and the nudging open, even further, of my heart. It was what my heroine had sought in her mythic journey and it was what I, unknowingly, had come for. And this healing was for more than myself. It was for my mother and daughter, and my female ancestors, all the way back to those who had fled our homeland of Poland to survive wars and poverty, and even further back than that. It was a breaking out of Patriarchal molds and a receiving and celebration of the Divine feminine and her nurturing, loving, and healing ways. On the last day of the trip, as I stood on the Hill of Tara, I could feel myself rooted, as if I’d become a part of the great, grassy mound, the buffeting winds having no power to sway me, and I drew through the soles of my feet from the sacred energy of the land –– for myself, for those I know and don’t know, those I love, and for our planet – so in need of healing – and I knew that I’d never be the same.